This class is a four-hour program that covers the basic types of fires and the chemistry involved in the extinguishment of those fires. The students will be trained how to inspect and use a handheld fire extinguisher on a live fire system. Upon the successful completion of the course, the student will receive a wallet certificate. 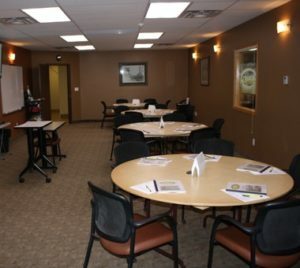 The classroom setting for fire extinguisher training is very learner friendly and interactive. Each student is able to view an assortment of fire extinguishers during the course and the instructor is able to demonstrate the proper use. 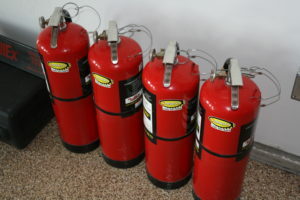 The fire extinguishers that students will use at Trinity Safety are current, relevant and functional. Participants will have classroom time and then use equipment in a safe warehouse on our fire simulator. 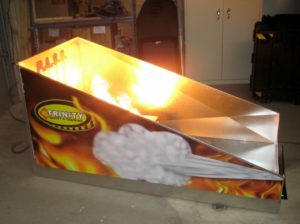 The Custom Trinity training simulator has been specifically built to teach the proper use of fire extinguishers.